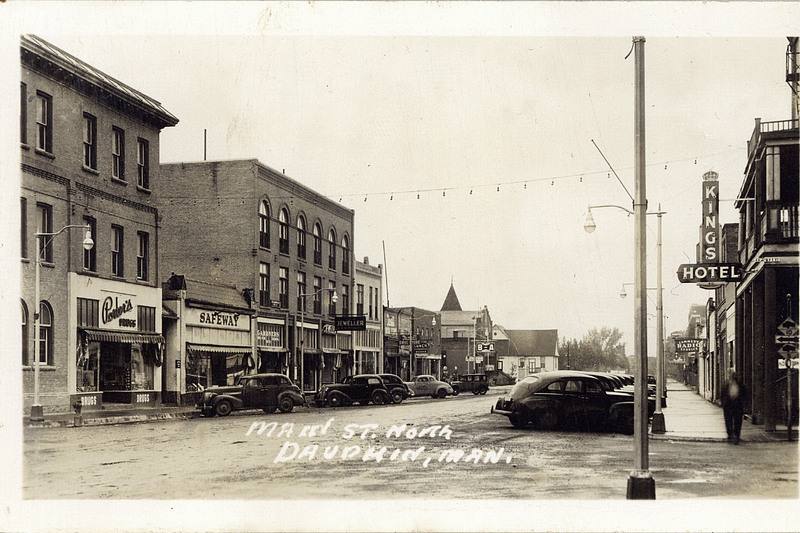 Main St. North, Dauphin, Man.. [Dauphin: c1940. Description: View of a commercial street. Several parked cars and a lone pedestrian are visible. Signs for a Safeway, the Kings Hotel, a jewellery store, and other business can also be identified. PC000275: "Main St. North, Dauphin, Man." is licensed by University of Alberta Libraries under the Attribution - Non-Commercial - Creative Commons license. Permissions beyond the scope of this license may be available at http://peel.library.ualberta.ca/permissions/postcards.html.